1 Department of Medical Biology, Medical School, University of Split, 21000 Split, Croatia, Fax: +38521557895, Tel: +38521557888, E-mail: tzemunik@bsb.mefst.hr. 2Department of Pediatrics, Clinical Hospital Split, 21000 Split, Croatia. 3Department of Biochemistry, Medical School, University of Split, 21000 Split, Croatia. 4Department of Forensic Medicine, Clinical Hospital Split, 21000 Split, Croatia. 5División of Molecular Medicine, Ruder Bošković Institute, University of Zagreb, 10000 Zagreb, Croatia. Type 1 diabetes mellitus (TIDM) is an autoimmune disease characterized by the destruction of pancreatic p cells. Tumor necrosis factor (TNF) is a pleotropic cytokine with potent immunomodulatory and inflammatory activity. Association studies of TNF polymorphisms and type 1 diabetes (TIDM) frequently demonstrated TNF involvement with TIDM. Although TNF may play an important role in the pathogenesis of TIDM, the genetic association of TNF región with the disease has not been conclusive because of the strong linkage disequilibrium with HLA genes. In this study, we examined two TNF promoter variants (rs 1800629 at position -308, and rs361525 at position -238) for TIDM association in 233 patients and 144 controls from the population of South Croatia. A higher frequency of TNF -308 A alíele and also, a more frequent specific -308A -238G haplotype in TIDM patients were observed with a limited significance. However, we did not find strong evidence of association of TNF promoter polymorphisms with TIDM. In order to elucidate the trae contribution of TNF to TIDM susceptibility in our population, more comprehensive studies with HLA adjustment in a larger sample are required. Key terms: type 1 diabetes, tumor necrosis factor gene (TNF), polymorphism, genetic epidemiology, Croatia. Type 1 diabetes mellitus (TIDM) is a multifactorial autoimmune disorder characterized by T-cell mediated destruction of the pancreatic |3-cells caused by múltiple genetic and environmental influences (Todd 1995). Although human leukocyte antigen (HLA) located on chromosome 6p21 seems to be responsible for above 50% genetic risk of developing TIDM, there are other important loci associated with the disease that include an insulin-linked variable number of tándem repeats (/iVS-VNTR) located at the 5' regulatory región of the insulin gene (IDDM2), limphoid protein tyrosine phosphatase non-receptor type 22 (PTPN22), cytotoxic T-lymphocyte-associated antigen 4 (CTLA 4), the interleukin-2 receptor a chain (IL2RÁ), the interferon-induced helicase región (IFIH1), inositol 1,4,5-triphosphate receptor 3 gene (ITPR3)(Todd 1995, Rich et al. 2006, Smyth et al. 2006, Roach et al. 2006). The most recent genome-wide association studies (GWA) for TIDM identified sugar binding C-lecitin type gene (KIAA350) and another four regions 12q24, 12ql3, 16pl3 and 18pll to be associated with TIDM (Hakonarson et al. 2007, Todd et al. 2007). The multifactorial cytokine, tumor necrosis factor (TNF) is involved in the promotion of inflammatory responses and plays a critical role in the pathogenesis of inflammatory, autoimmune and malignant diseases (Bazzoni and Beuther 1996). Although the contribution of TNF to T1DM is not well established in humans, it has been shown in animal models that TNF can be cytotoxic for (3-cells supported by both interleukin-1 and interferon-y (Rabinovitch 1994, Rabinovitch and Suarez-Pinzon 1998). NOD mice that overexpress TNF in their (3-cells are predisposed to diabetes (Vaux and Flavell 2000). Moreover, it has been reported that levéis of circulating monocytes and T-cells type 1 proinflammatory cytokines are elevated in patients at the onset of diabetes (Hussain at al. 1996). The TNF gene is located on chromosome 6 in the HLA región class III, 250 kb centromeric of the HLA-B and 850 kb telomeric of the class II HLA-DR genes in humans (Hamaguchi et al. 2000). Several TNF promoter polymorphisms have been identified and have been implicated in the regulation of TNF transcription (Kroeger et al. 1997 and Wilson et al. 1997). Single nucleotide polymorphisms (SNPs) at the positions -308 (rsl800629) and -238 (rs361525) of the promoter región of the TNF gene have been commonly studied. Both polymorphisms are G^-A substitutions and changes they introduce can alter the transcription-binding site and affect the transcription rate (Kroeger et al. 1997). Indeed, -308 polymorphism affects gene expression with a rare A alíele, resulting in higher in vitro TNF production (Bouma et al. 1996). As well, the rare TNF -238 A alíele has been associated with high TNF production (Grove at al. 1997). Since both promoter polymorphisms have been associated with the transcriptional enhancement rate, it is possible that when acting in cis, these two markers show even stronger interaction (Kroeger et al. 1997 and Kaluza et al. 2000). A relation between genetic variability of TNF and T1DM is widely suggested, but linkage disequilibrium (LD) between TNF and HLA alíeles makes it difficult to evalúate the involvement of TNF alíeles alone with T1DM susceptibility (Feugeas et al. 1997). Kumar et al reported a significant increase of TNF -308 G/A and A/A genotypes in North Indian T1DM patients (Kumar et al. 2007). Das et al. 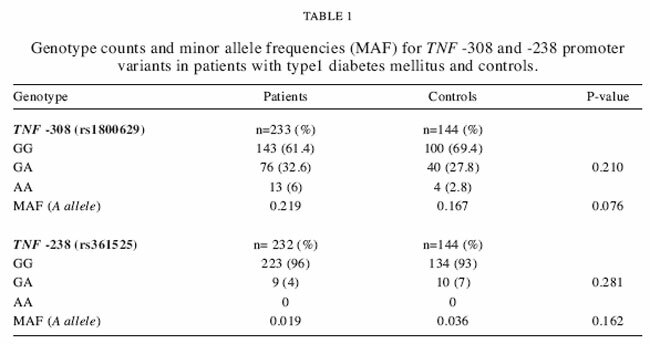 suggested a significant association of TNF -308 A alíele and G/A genotype with T1DM in North Indians, but did not observe such association with -238 SNP (Das et al. 2006). Krikovszky observed the same increase in the prevalence of TNF -308 A alíele in diabetic patients in the Hungarian population (Krikovszky et al. 2002). In contrast, Deng et al. excluded -308 polymorphism to be a genetic element for susceptibility to T1DM in Chinese and Caucasian populations and reported that the associations of the TNF gene are due to a LD between TNF and DR3-DQB 1*0201 haplotype (Deng et al. 1996). Noble et al. initially found association of TNF -308 and -238 polymorphisms with T1DM, but after adjusting the data for LD with DRB1-DQB1 and B18-DR3 haplotypes, the association lost its significance (Noble et al. 2006). As well, Deja et al. reported that association between TNF -308 A alíele is dependent of HLA-DRBÍ and DQB1 alíeles in the Polish south-west population (Deja et al. 2006). As we can see, the association of TNF polymorphisms with T1DM was suggested to be due to its carrying specific DR-DQ haplotypes by some, but not all studies (Stayoussef et al. 2007). Several studies observed an independent effect of TNF -308 polymorphism to T1DM (Das et al. 2006, Krikovszky et al. 2002). Kumar et al. suggested that the effect of TNF -308 A alíele to susceptibility to T1DM is not due to LD with HLA alíeles, but rather to its functional role in the destruction of pancreatic beta cells and its integrated effect with other cytokines (Kumar et al. 2007). Croatians have a typical European maternal and paternal genetic landscape, with the exception of some mitochondrial DNA (mtDNA) and Y-chromosomal haplogroup that indicate connection to Central Asian populations. Moreover, structuring of the Y chromosome point to a Slavic component in Croatian men. Analysis of mtDNA and the non-recombining región of the Y chromosome shows predominance of "Paleolithic" mutations that are in concordance (70-80%) with the range of "Paleolithic genes" present in the European population gene pool. Observed mitochondrial profile and the low percentage of "Neolithic mutations" in Croatia indícate a good agreement with neighboring populations. Higher frequency of "Neolithic haplogroups" found in the Y chromosome indicates that a large part of Croatia belongs to the Mediterranean región. Eastern Adriatic islands of Krk, Brac, Hvar and Korcula represent reproductive isolates of relatively small size, where genetic drift and founder effect have significant roles in shaping genetic diversity (Pericic M et al. 2005). The large islands Brac, Hvar and Korcula, some other small islands, and the southern part of the Croatian mainland represent South Croatia. The present study was undertaken to ascertain the association of TNF -308 and -238 promoter polymorphisms with T1DM in the South Croatian population. The study included 232 unrelated Caucasian patients (121 men and 111 women) from the Dalmatian región of South Croatia. The mean onset age of T1DM was 8.64.2. T1DM was diagnosed according to the World Health Organization criteria and all the patients required insulin for glycaemic control (Harris et al. 1985). The control group of 144 (67 men and 77 women) unrelated consecutive subjects was randomly recruited from individuáis who carne to the Split Clinical Hospital for general health check-ups. The mean age was 8.14.1. This study was approved by the ethics committee, and informed consent from patients and their parents was obtained prior to the blood sampling. Genomic DNA was extracted from peripheral blood leucocytes using the Perfect gDNA kit (Eppendorf, Hamburg, Germany). TNF -308 (rs 1800629, G/A) and -238 (rs361525, G/A) promoter genotypes were identified by polymerase chain reaction, followed by restriction fragment length polymorphism (PCR/RFLP), according to previous reports (Wieser et al. 2002). The PCR amplified fragments (141 for -308 SNP and 151 bp for -238 SNP) were digested with Ncol and Mspl to detect G to A transition at the -308 and -238 promoter sites, respectively. The digested fragments were separated on 10% polyacrylamide gels and visualized by ethidium bromide staining. Results for TNF -238 SNP were quantitatively checked on Agilent 2100 Bioanalyzer (Agilent Technologies, Palo Alto, CA, USA). As a measure of quality control (QC), 30% of samples were re-genotyped in order to confirm previously established genotypes. Prior to association analysis, QC of the obtained genotypes was performed. As a part of QC, Hardy-Weinberg equilibrium (HWE) was tested in healthy controls and minor alíele frequencies (MAF) were compared with phase II HapMap (www.hapmap.org) MAF from the CEU population (The International HapMap Consortium 2003). Genotype and haplotype comparison between patients and controls were done by the chi-square test using Statistica 6.0 (StatSoft, Inc, Tulsa, OK). Haplotype analysis was made using the statistical program EHPLUS. This program assumes that alíeles at different loci occur independently so haplotype frequencies are formed as the product of constituent alíele frequencies (Zhao et al 2000). r2 and D' measures of pairwise LD for two investigated SNPs were calculated using Haploview (Barrett et al. 2005). Power calculation was done using Quanto (Gauderman 2002). P-values less than 0.05 were considered nominally significant. QC analysis established both SNPs to be in the HWE. MAF in healthy controls were concordant with phase II HapMap frequencies from the CEU population. Re-genotyped samples confirmed previously established genotypes. Genotype counts and MAFs for TNF -308 and -238 SNPs in patients with TIDM and the control group are shown in Table 1. Genotype distribution for both TNF promoter variants did not differ between TIDM patients and controls. The TNF -308A minor alíele was more frequent in the TIDM patients and showed a limited significance (P=0.076). The results of a haplotype analysis are shown in Table 2. Specific (-308A -238G) haplotype was observed more often in the TIDM patients than in controls, but showed a borderline significance (P=0.076). Two investigated SNPs were not in LD with each other (r2 =0, D'=0). This study had 80% statistical power to detect (at a=0.05) an effect of [OR] =1.62 for -308 SNP assuming an additive model and was underpowered to detect the same effect for -238 SNP. This association study analysed a relation of two TNF gene promoter polymorphisms (-308, -238) with TIDM in a case-control sample from South Croatia. Specific haplotype (-308A -238G) was observed more often in TIDM patients than in controls with a borderline significance (P=0.076). Consistently, TNF-308 alíele A was found to be more frequent in TIDM patients but also with limited significance (P=0.076). However, a genotype distribution of G-238A and G-308A TNF promoter variants did not differ between patients and controls. In haplotype analysis we did not observe -308A -238A haploype. This haplotype is constituted of two rare TNF promoter alíeles and the probability of its occurrence was 1.9 (9 haplotypes) in patients, 1.7 (8 haplotypes) in controls and 3.7 (28 haplotypes) in combined dataset (patients and controls). The Poisson distribution for finding 0 haplotypes in combined dataset produced a significant p-value (p=0.027). This implies that -308A -238A haplotype could produce some great impairment that could be lethal or semi-lethal to all individuáis who carry this haplotype, and that could be a reason for not observing it in our combined dataset. However, a possibility of not observing -308A -238A haplotype in our dataset could also be due to a simple chance event. The TNF gene is located inside the HLA III región that contains about 10 times more genes than other regions in the genome and is considered to be the densest región in the human genome (Nishimura et al. 2003). Beside HLA DR/DQ locus of the HLA región II, HLA class III región, particularly around the TNF gene, has been regarded as a susceptible locus for TIDM (Nishimura et al. 2003). In our study we observe the same trend of increase of TNF -308 A alíele frequency in TIDM patients, suggesting a small effect of this alíele on susceptibility toTIDM. Some reports show that the association between alíeles at the TNF locus and TIDM can be attributed to LD with the susceptible DQB1-DRB1 haplotypes, instead of an independent effect (Feugeas et al 1997, Koeleman et al. 2000, Deja et al. 2006). However, several other studies reported an independent effect of the TNF gene with TIDM (Das et al.2006, Krikovszky et al. 2002 and Kumar et al. 2007). Different studies presented above have shown different TNF impact on TIDM susceptibility, probably due to differences in surrounding environmental factors and in LD relations between TNF and HLA genes. LD differences are most probably caused by genetic admixture, isolation or some other historical facts. The population of South Croatia partly consists of reproductive isolates located on a few Adriatic islands. The phylogeography of mtDNA and Y chromosome variants of South Croatians present typical European maternal and paternal genetic landscapes, with certain connections to Central Asian populations, the Mediterranean región and a clearly evident Slavic component in the paternal gene pool (Pericic M et al. 2005). Since HLA loci have not been typed in our sample, we cannot measure the LD between HLA and TNF loci. However, our population shares a great similarity in genetic background to other European populations, and we assume that HLA-TNF LD relations are like those in other European populations. Nevertheless, specific environmental factors, lifestyle and the possible existence of specific population-based polymorphisms can alter LD relations and influence the TNF gene effect on susceptibility to TIDM. Therefore, although we cannot determine if the effects of TNF SNPs are primarily or secondarily to HLA loci, we believe these are valuable population specific results. As well as LD between TNF and HLA genes, interaction of the TNF gene with other pro- and anti- inflammatory cytokine genes plays an integrated role in destruction of pancreatic beta cells (Koeleman et al. 2000, Kumar et al. 2007). Also, TNF promoter -308 and -238 polymorphic sites have been shown to enhance the rate of transcription of TNF gene (Kroeger et al. 1997). The functional effect of TNF promoter SNPs on TNF expression, immunomodulatory effects of TNF and its role in the destruction of beta cells support the idea of independent TNF influence in susceptibility to TIDM. In conclusión, this study is the first to investígate two TNF gene promoter polymorphisms (-308 and -238) in a case-control sample from South Croatia. This study observed, with a limited significance, a higher frequency of TNF -308 A alíele and a specific (-308A -238G) haplotype in TIDM patients. However, we did not find strong evidence of association of TNF promoter polymorphisms with TIDM. It is important to evalúate these findings in additional investigations with a larger sample that will be sufficiently powered to detect a true association. Extended haplotype analysis across the región, and adjustment for HLA alíeles, are needed to elucídate the contribution of TNF genotypes and haplotypes to T1DM susceptibility. This study was supported by the Croatian Ministry of Science, Education and Sports (Genetic epidemiology of type 1 diabetes mellitus in Croatian population, project number 216-1080315-0293). Corresponding Author: Tatijana Zemunik Department of Medical Biology, Medical School, University of Split 21000, Split, Croatia. Received: March 3, 2008. In Revised form: May 21, 2008. Accepted: June 9, 2008.